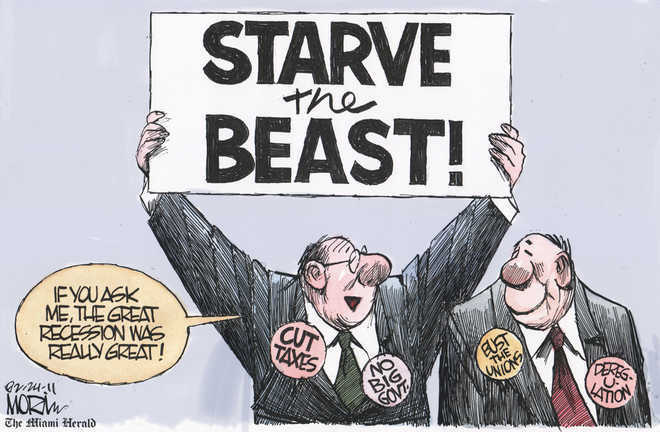 Nobel Prize winning economist Paul Krugman described the conservative "starve the beast" fiscal political strategy in 2010, "Rather than proposing unpopular spending cuts, Republicans would push through popular tax cuts, with the deliberate intention of worsening the government’s fiscal position. 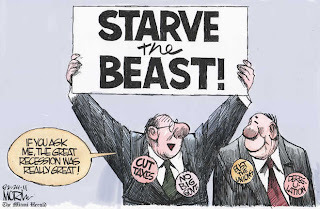 Spending cuts could then be sold as a necessity rather than a choice, the only way to eliminate an unsustainable budget deficit ... Republicans insist that the deficit must be eliminated, but they’re not willing either to raise taxes or to support cuts in any major government programs. And they’re not willing to participate in serious bipartisan discussions, either, because that might force them to explain their plan — and there isn’t any plan, except to regain power." Panderbear thinks Krugman has it about right. Panderbear also thinks the leader of the constitutional convention and first Secretary of the Treasury, Alexander Hamilton, had it about right in Federalist Paper No. 15, "A government ought to contain in itself every power requisite to the full accomplishment of the objects committed to its care, and to the complete execution of the trusts for which it is responsible, free from every other control but a regard to the public good and to the sense of the people." This statement suggests the starve the beast strategy puts the cart before the horse. It is necessary to decide the scope of services we want from our government, before deciding what powers, including taxation, it should have and to what extent it should exercise them. No one wants a government bigger than necessary. Bumper-sticker conservative political slogans about small government are pure pandering. Having decided what tasks we require of our government we must then fund it exactly enough to accomplish those tasks. No more and no less.